After 19 years of teaching fraction skills to fifth graders, there are some things that I'm willing to give my students for the sake of a smoother lesson when they don't have the needed prerequisite skills. 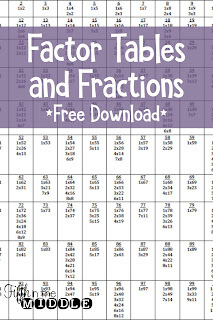 One thing is a multiplication chart for finding the least common denominator for more common fractions. 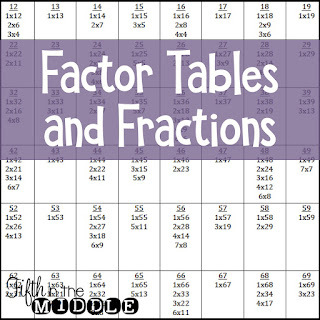 Another tool that I provide is a table of all factor pairs of numbers 1-100. Not only is it a good tool to see prime and composite numbers, it's great for finding the greatest common factor for simplifying fractions. Is this something that your students could use? Click on either image in this post to download your own. It's free! I have been using a chart like this for years with my 6th grade special ed kiddos. It is a life saver! A bit dramatic, but really does help! Thanks for sharing to other teachers. You can even leave a few blank and the students fill in what is missing. Thanks for sharing.